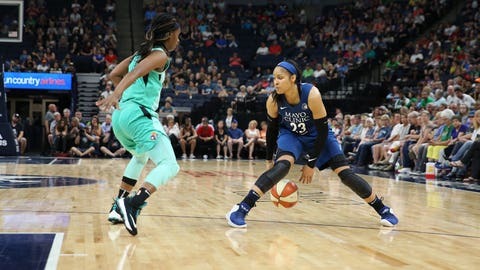 MINNEAPOLIS — Sylvia Fowles scored 25 points, hitting 10 of 13 shots, to help the Minnesota Lynx beat the New York Liberty 85-71 on Saturday night. Maya Moore added 20 points and Cecilia Zandalasini scored 13 for the Lynx (4-6), who had lost five of six coming into the game. Minnesota went on a 10-0 run to extend its lead to 68-45 on Moore’s jumper with 3:11 left in the third quarter. New York had an 8-0 run to cut the deficit to 77-61 but then went scoreless for over three minutes and failed to challenge the outcome. Tina Charles had 12 points for the Liberty (3-6), who have lost four of the last five. The Lynx took control early and already had their lead in double digits at 22-11. New York had only five rebounds in the first half and Minnesota finished with a 35-22 edge on the glass.